Huge assortment of first aid care items in one organized case. Great for the house, automobile, or for business. 50 person set includes: 50 Adhesive bandages 1″ x 3″. 30 Adhesive bandages 3/4″ x 3″. 20 Adhesive bandages 3/4 x 3/8″. 3 Knuckle bandage. 3 Fingertip bandage. 2 Tape roll. 1 Triangular bandage. 1 Trauma pad (5×9). 1 Eye pad. 4 Gauze pad 4″ x 4″. 4 Gauze pad 3″ x 3″. 4 Gauze pad 2″ x 2″. 1 Gauze Roll 2″. 1 Gauze Roll 4″. 4 Examination gloves. 1 Instant cold pack. 1 Tweezers. 10 Burn creams/first aid creams. 10 Sting relief pads. 30 Alcohol pads. 20 Antiseptic towelettes. 1 Metal case. 1 First aid guide. 1 Emergency blanket. 4 Finger splints tongue depressors. 20 Cotton tip applicators. 1 Filtration mask. 1 Eye wash.
Buy more than one kit and recieve better pricing……Please call. 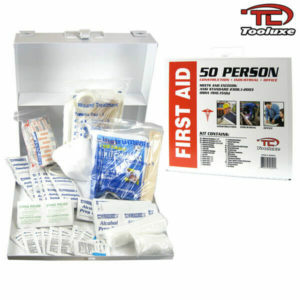 All of our 25 and 50 Person First Aid Kits are made for the workplace. These kits all meet and exceed Ansi Standard 2308.1-2003 as well as Osha 1910.151(b).